He has just written and headlined with “US remains reluctantly tied to global security role” – categorised under US/Canada. “America’s military finds itself pulled in several directions – and even the $582bn (£403bn) defence budget rolled out earlier this month will not be enough to satisfy all of its needs. New challenges – from Russia and the so-called Islamic State (IS) group – are forcing the Pentagon to change its plans, and reopening old arguments about whether its allies are doing enough. One of the headlines to come out of the new budget was a quadrupling of spending on US military preparations to defend allies in Europe. When Nato boss, Secretary General Jens Stoltenberg, says the alliance is facing its “most challenging security environment in a generation”, he is thinking principally of the challenge posed by a “newly assertive Russia”. Urban is clearly deluded. The ‘new challenges’ the US are facing are self imposed. ISIS, a deliberately manufactured and well funded terror group is designed to carry out American operations in Syria. In the meantime, Russia has made no threat of any kind to the European Union or any members of it in the context of his report. Is this is the same global security guard that the BBC refers to where General Wesley Clark, Retired 4-star U.S. Army general, Supreme Allied Commander of NATO admitted that “We’re going to take out 7 countries in 5 years: Iraq, Syria, Lebanon, Libya, Somalia, Sudan & Iran..”? (see the enlightening Global Research Article and video interview HERE). “France and Great Britain, leading a NATO (North Atlantic Treaty Organisation) alliance, are effectively at war in Libya on the pretext of a United Nations’ mandate. The United States led the early charge against Libya’s Gaddafi from the air, but has taken something of a back seat and allowed Britain and France to continue what can now be considered a war of aggression against a sovereign African state, far beyond the mandate of the UN.” Is that the description of a world peacekeeper or security guard? Is being the architect of ‘global anarchy’ the description of a global security guard? No, I didn’t think so either. The Centre for International Strategic Studies 2015 report entitled “ISIS and the Failed State Wars in Iraq and Syria” highlights the rise of Islamic State and its devastating aftermath in Afghanistan, Yemen, Iraq, Syria and Libya, all (compared to US military firepower) nations barbarically attacked by the US leaving millions of innocent civilians dead or displaced and a power vacuum ideal for thugs, gangsters and maniacal terrorists to thrive. The entire European Union project, one where the objective to harmonise a continent that had been in conflict for centuries is now under threat, described by TIME as “A migrant crisis that threatens the fall of the EU” and likens it to the fall of Rome. The migrant crisis is largely the result of US foreign policy in the Middle East and Africa in its selfish and unrelenting pursuit for power, money and glory. Urban’s assertion that the US is “bailing out Europeans who are unprepared to fund defence properly” is a crass and unwarranted statement whose hypothesis lies in the depths of state propaganda. The EU is currently enduring an existential economic meltdown that is driving an austerity programme not witnessed since the aftermath of the first world war. And yet, it spends 2% of its $18.5 trillion or $370 billion on its military capability when the bloc is not at war. Urban states that the US has stepped up spending on EU defence from $800m to $3.1billion – less than 1% of the EU budget. America has funded that increase by slashing $1.4 billion off its own budget on US war veteran healthcare that sees nearly one million appointments a week and over 8,000 veteran suicides each year. In comparison, the permanently at war nation of the US declares an annual military budget that actually turns out to be $726billion. Just last year alone, the US spent about £1million a day since the birth of Christ – in a global killing spree of innocent victims whilst gorging on the profits of war. The irony of ‘God Bless America’ unfathomable. 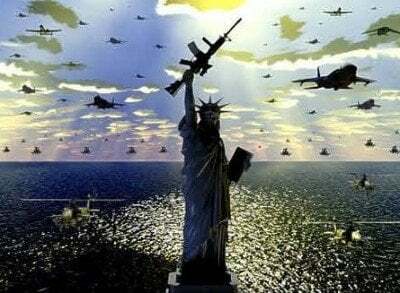 The US has not been attacked by any sovereign state since the second world war but has invaded, usurped, destabilised or destroyed around forty unsuspecting countries and left a trail of death in the tens of millions and indescribable destruction and misery in its avoidable egregious path. Canadian geography Professor Jules Dufour and CRG Research Associate produced a study published by Global Research in 2007. Its findings were that the US has military bases in 156 countries around the world. There are 737 facilities covering 30 million acres with 255,000 military personnel. The total land area occupied by US military bases within the US and internationally is of the order of 2,202,735 hectares, which makes the Pentagon one of the largest landowners worldwide. The reason? To have control over the world economy and its natural resources. The BBC describes this as the US being a reluctant global security guard – this is nothing but shameless blatant propaganda and a misuse of taxpayers funding.